It is winter in Adelaide now. Each passing day is getting nothing but colder. I'm bundling up just to run a round to the supermarket to get ingredients for this yogurt ice creams. Melts pretty quickly in my warm room, wasn't quick enough to take decent shots. However, this does not affect the taste. They were so good on their own I refuse to pair them with biscuits nor dribble anything over. 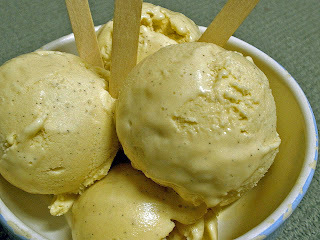 See the vanilla specks all over the little scoops. My new found baby, vanilla paste. Way more convenient than vanilla pods and way better than vanilla essence. And way more expensive too. I've been procrastinating to buy them for ages...very steep price indeed. It's approximately AUD9.30 after special discounts for a 65ml bottle. This recipe is generously included in the book, Apples for Jam by Tessa Kiros. She's awesome. She's like my next favorite after Nigella, the way she writes and all. This book is sectioned into 10 different color sections and a final multicolor section. I like this very much and hope you like it as much as I do! This is lovely-not too sweet-as it just really tastes like frozen yoghurt. of granola over the top. Alternatively, pour into your ice cream machine and churn, following the manufacturer's instructions. Sometimes I watch them and see that they are counting between each bite to make their ice cream or chips last as long as possible. And they separate the food up into groups on their plates and save, just like I did, the best for last.